The Transaction ID feature in Adobe Analytics is one of the most underrated in the product. Transaction ID allows you to “close the loop,” so to speak, and import offline metrics related to online activity and apply those metrics to pre-existing dimension values. This means that you can set a unique ID online and then import offline metrics tied to that unique ID and have the offline metrics associated with all eVar values that were present when the online ID was set. For example, if you want to see how many people who complete a lead form end up becoming customers a few weeks later, you can set a Transaction ID and then later import a “1” into a Success Event for each ID that becomes a customer. This will give “1” to every eVar value that was present when the Transaction ID was set, such as campaign code, visit number, etc…. It is almost like you are tricking Adobe Analytics into thinking that the offline event happened online. 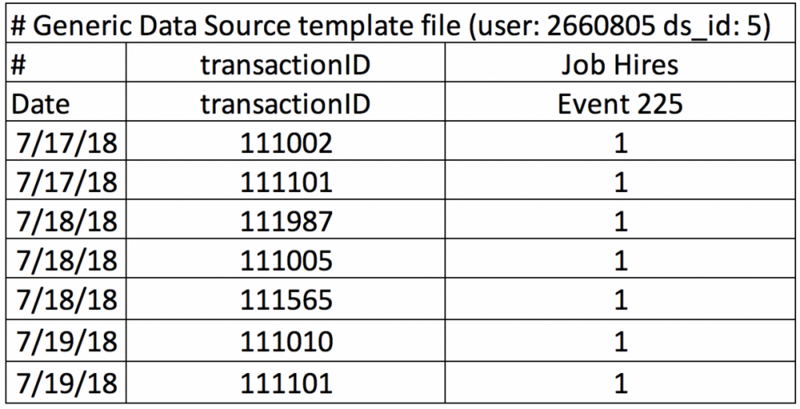 In the past, I have described how you could use Transaction ID to import recurring revenue and import product returns, but in this post, I will share another example related to Human Resources and recruiting. This allows you to then create Calculated Metrics to see which marketing campaigns are most effective at driving new hires. This is a creative way to apply the concept of Transaction ID, but as you can imagine, there are many other ways to utilize this functionality. Anytime that you want to tie offline metrics to online metrics, you should consider using Transaction ID.